And those are the three key components of “Passivhaus” design, a highly energy efficient building construction standard that has been successfully applied in more than 25,000 buildings in Europe. So far, only a handful have been built in the U.S. You might wonder—as I have written previously—what’s our excuse? The photo above shows Dan Whitmore’s nearly completed Courtland Place Passive Project, Seattle’s first permanent building designed to the Passivhaus standard (the Mini-B Passive House isn’t a permanent structure). The mother-in-law unit has been occupied for two months, and according to Whitmore so far the heat was turned on for a grand total of about five minutes on one especially frosty morning in March. Aside from that brief lapse, the excess heat generated by appliances, people, and the sunlight coming through the windows was enough to keep it comfortably warm inside. I can attest that the space was warm, almost too warm, on the partly sunny but cool spring day of the Ecobuilding Guild’s recent green home tour. And yes, the heat recovery ventilator has to run 24×7 in cold weather when the windows are closed, but it only consumes about as much as a 50 watt light bulb. Whitmore’s house has no furnace—a significant up front cost savings. On the coldest days it can be heated with two small baseboard electric heaters, or by running water from the domestic hot water tank through the heat recovery ventilator. But is it expensive? 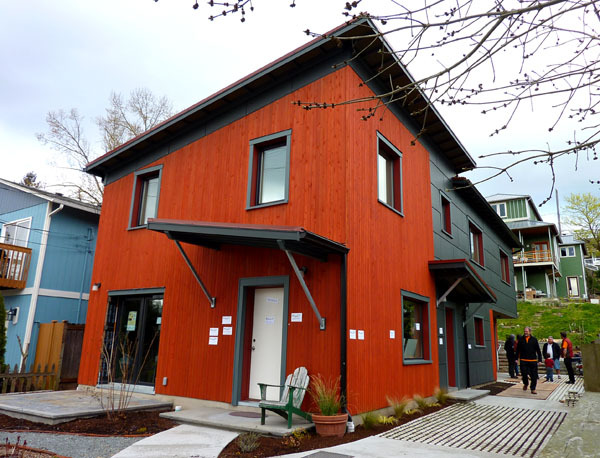 A recently completed Passivhaus in Portland reportedly had a 10 percent cost premium over conventional construction (the windows are a major part of that premium). In Germany where contractors have experience with the standard, typical cost premiums run five to eight percent. But the reduction in energy use provides both a direct cost payback that is guaranteed to sweeten as energy prices inevitably rise, and a public benefit payback from a reduction of the myriad externalized costs associated with energy consumption. And then there’s the potential payback in “green jobs.” What if all those triple pane windows were manufactured locally? Furthermore, the impact of “efficiency first” strategies like Passivhaus tend to have broad, positive repercussions across systems. For example, would there be any need for a major investment in district heating systems at Yesler Terrace if most of the buildings were designed to the Passivhaus standard? Seattle City Light gives away fluorescent light bulbs for the same underlying reason. At this stage in the climate change/peak oil game, projects like Whitmore’s Passivhaus ought to be the norm for new construction. And to help make that happen we desperately need meaningful incentives at the local, State, and Federal levels. Preferably yesterday, please, if not sooner. Triple pane windows are all but standard for new construction in Canada, but my efforts to bring them to Seattle have so far been fruitless (despite having architects that have the right mindset – it’s always a first-cost issue from the owners). HRV’s are gaining ground and I’ve been designing them into schools, dorms, and offices for years. They’ve finally come out with cheap residential units with aluminum cores instead of stainless steel. One or two units costing $450 plus some good design (you need your exhaust and supply air to be ducted to the same spot) sounds like a bargain to me. Hey, look, a cool German passivhaus with water-cooled solar PV on the roof! We’ve been working on a Passive House project (9 townhouse units) in Seattle, and the cost delta was 8% between conventional construction and Passive House. Since most of the cost is in the skin (windows, air sealing, insulation), having a larger, compact structure works to our advantage, cost wise. Your project looks great, Matt, thanks for the heads up. I’m wondering how long we’ll have to wait for a progressive developer to go for Passivhaus with a large-scale, 5-over-1 type building. Any takers out there? Thanks! I’ll keep you in the loop…. the key to getting a developer to jump on board is the realization that long term, you’re looking at a relatively short payback period, and oodles of cash in your pocket beyond that – especially as the cost of energy rises. although there are several selling points that should also help maximize occupancy – such as superior comfort, superior air quality, etc. frankly, any developer who plans on owning/operating a building but doesn’t shoot for passivhaus is a. not too bright, b. passing up on opportunity to recoup hundreds of thousands, if not millions of dollars over the life of the building. with larger developments, you don’t need as costly windows or the ‘super’ insulation levels you would for a single family home. it’s definitely not something i’d tack on on after the fact, and tougher than you think – bullitt’s casacadia center wouldn’t even qualify for passivhaus. Multi-family passivhaus has a great future. Long-term apartment building owners have an incentive to invest the construction cost premium, while reaping the long-term benefits of low-to-no utility costs. Owners simply offer to include all utility costs in the rent: tenants are happy because the living is cheaper; Owners are happy because their aren’t many utility costs for them to pay. I don’t agree with the no-bills strategy. People drop consumption dramatically when given bills, and people without bills have no incentive to turn off the lights or turn down the heat. Hey Dan – Great post. A quick comment on what I think is a false choice between district energy and green building (eg, the “Passivhaus”). Energy efficiency and green building should be seen as strategies to free up thermal heating capacity that enables larger district energy systems, rather than as a substitute for district energy. The city’s current DE consultant, Trent Berry, has a great saying for what results when you pursue a building-by-building strategy of sustainability: “bright green in a sea of brown.” I think we (the royal “we”) are finding that the future of sustainability is on the district scale – bright green homes and buildings are part of this, and not in lieu of it. Passivhaus construction should be incorporated into the Yesler Terrace. It would reduce heating demands to the point where the lower-cost ground-source “two pipe” solution is feasible. No need to burn fossil fuels to heat the water. If you would like to learn more about Passivhaus, we have a presentation we’re happy to bring to interested groups. In the last few weeks we’ve presented to the Seattle Energy Design Roundtable, Seattle City Council Central Staff, Representative Jim McDermott, and University of Washington Capital Resource Planning. This week Miller|Hull and next week, GGLO. “We” are several members of Passive House Northwest (http://phnw.org): Dan Whitmore, designer and builder of the Courtland Place Passive House; Joe Giampietro, designer of the Mini-B Passive House now at PNA; Mike Eliason, brute force collaborative; Jim Burton, president of PHnw; and myself. The presentation includes examples of large scale commercial and institutional Passivhaus projects, as well as residential Passivhaus projects either on the boards or under construction in Portland and Seattle.